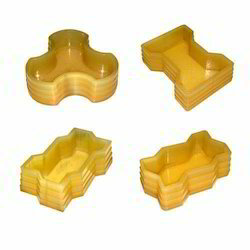 Manufacturer of a wide range of products which include pvc & plastic paver block mould. We are a widely recognized firm for manufacturing and supplying a wide range of high quality PVC & Plastic interlocking Block & Brick Making Moulds and chequrred tiles moulds. Price- Rs 145/kg for pvc mould, cost of plastic moulds varies from Rs 45/ = per piece to Rs 70 per piece depending on type and shape & size. We Supply Plastic Brick Making Mould In Delhi / NCR Only. Looking for Plastic Brick Making Mould ?